Many bloggers like to have some perfect and totally unique blogger template for their blog, well now-a-days Wordpress blogs are having awesome design as they are highly powered with HTML5 and CSS3. There are lots of blogger blogs codded with HTML5 x CSS3 like Sensational 2.0 Ultra Responsive Blogger Template which I had released last month, Today I'm going to release my own creation, another responsive blogger template. This is might be unique and perfect template for your blog. Since many days I was busy with my college so I didn't get time to release this template, but now you can enjoy this Template. I hope you would like this awesome template. 1. Simple and Sleek Wordpress style template. 2. Ultra Sense with on hover Responsiveness. 4. Cool Breadcrumbs for best navigation to blog users. 5. Added Social Sharing Buttons. Well the Favela Theme is really awesome, I honestly recommend you to try out the live demo of this template and yeah its FREE you can use this theme right now ! 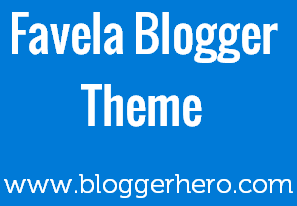 Releasing this Awesome template for Free, you can use this template for your Blogger Blogs. Note : Please do not edit any further coding than I have mentioned above otherwise the template might not work. Just install and enjoy. Thanks for your responce Akshay, Stay connected for more awesome templates !